“Jaber Al Ahmed City is the Kuwait Public Housing Authority’s latest contribution to the urban and housing welfare of its citizens. Currently under construction, the new town will ultimately be home to some 65,000 people. 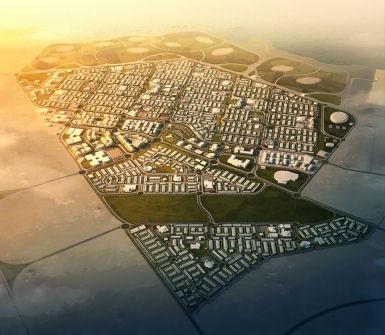 Jaber City is located approximately 25 km west of Kuwait’s central area, overlooking the western end of Kuwait Bay, with excellent links both to the city centre and other activity nodes of the metropolitan area. The new town’s living areas were designed with convenience and ease of access to daily services very much to the fore. Situated between the town’s central area and the coast, three distinct neighborhoods were created, each with its own neighborhood centre and a full complement of support services. A sense of identity is engendered within the living areas by the creation of communities, each being home to an average of one hundred families. At the heart of each community is a local park, linked via a pedestrian way to schools, mosques, local shops and district parkland. 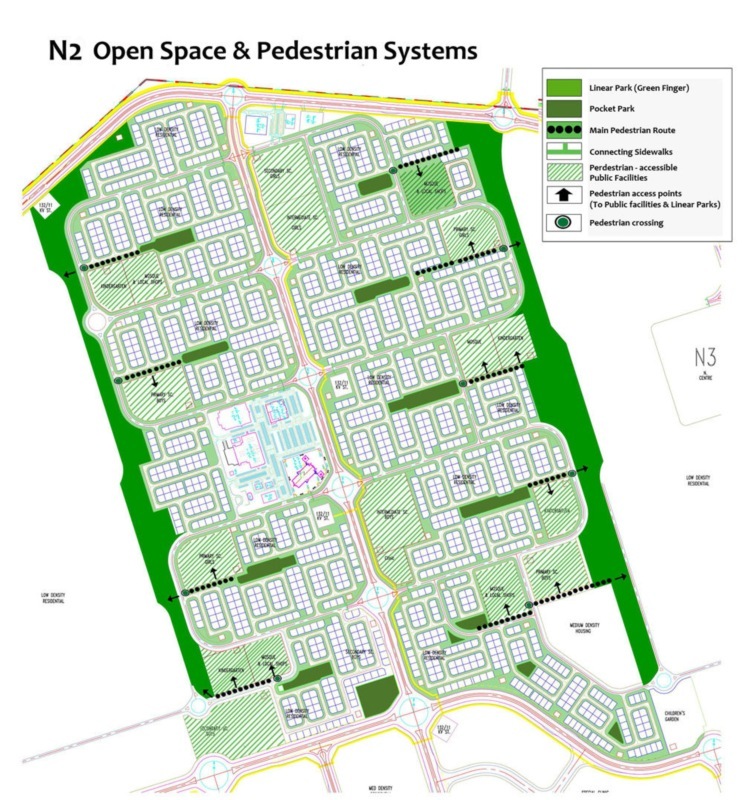 Most community residents will be within 200-300 m of these facilities. 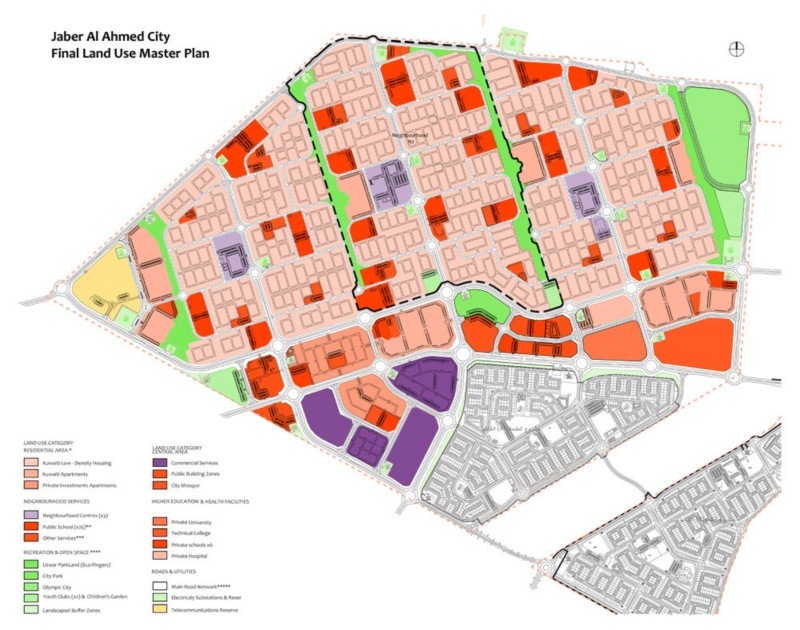 Jaber City is planned with a complete hierarchy of recreational facilities and parkland. Its trademark open spaces are its four linear parks which flank the neighborhoods and connect to a planned coastal park to the north. Aligned in parallel with the prevailing on-shore breezes these parks are designed to channel the cooling breezes into the heart of the town’s living areas.